A Royal Navy frigate escorted a Russian warship on Christmas Day as it passed close to British territorial waters, the ministry of defence said Tuesday at a time of strained relations between London and Moscow. 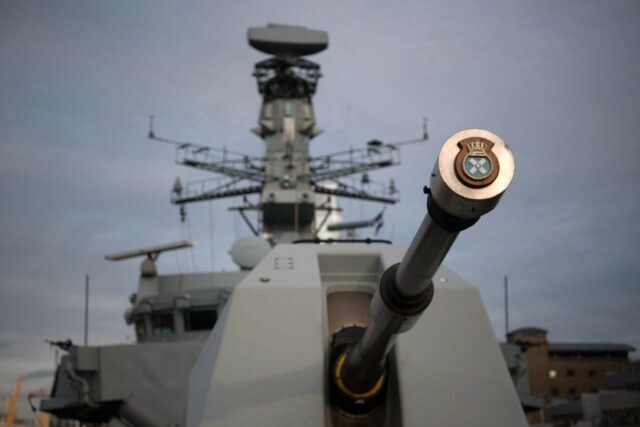 The HMS St Albans monitored the Russian frigate Admiral Gorshkov in the North Sea, “keeping track of its activity in areas of national interest,” it said in a statement. The St Albans, a Type 23 frigate, was deployed on Saturday to track the Russian vessel and would return to its Portsmouth base Tuesday. “I will not hesitate in defending our waters or tolerate any form of aggression,” defence minister Gavin Williamson said in a statement after the incident. The defence ministry said there had been a recent “upsurge in Russian units transiting UK waters”. It said the patrol ship HMS Tyne also escorted “a Russian intelligence-gathering ship” through the North Sea and the Channel on Sunday. A navy helicopter was sent to monitor two other Russian vessels. HMS St Albans was also involved in escorting a Russian aircraft carrier and missile cruiser through the Channel in January this year. Relations between London and Moscow have been hostile for years, with allegations of Russian meddling in Britain’s referendum on leaving the European Union and Moscow’s intervention in Syria on the side of the Damascus regime further straining already tense ties. British foreign minister Boris Johnson clashed with his Russian counterpart Sergei Lavrov in Moscow last week even as they sought to mend relations.